If you’re reading this post I’m almost certain you are aware of the impact your diet can have on your hormonal imbalance symptoms – from PMS to PCOS, from cramps to endometriosis, from low libido to weight gain. You know that some foods make these health issues worse and some can make them so much better. 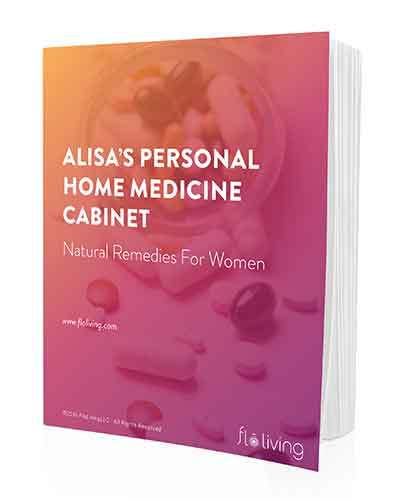 However, if you’re eating healthily and even following the Flo Living diet protocol, you might still be missing an essential ingredient of creating the kind of hormone-safe lifestyle that will protect you from these symptoms. That missing essential ingredient is in your cleaning supply closet. Because we don’t spend more than perhaps a few hours a week handling these products, we may not think they can possibly have an impact on our health. Yet, cumulatively the hours stack up that we are using, touching, and making skin contact with these chemicals, especially those that can linger on the items we are close to every day – like our clothes. We think picking our cleaning products, especially our laundry detergent, really should be just a matter of what works. And that’s true. We do need products that get our clothes clean and don’t mean spending hours washing and rewashing items to get the desired result. We also need to prioritize our own health. Top selling brand name detergents have been found to contain high levels of petrochemicals which are endocrine disruptors – they disrupt your body’s creation of its own hormones, use of those hormones and elimination of excess hormones. They introduce estrogen-mimicking synthetic hormones into your blood stream through skin contact that can undo all of your best efforts with your diet. These synthetic estrogens create estrogen dominance in the body – a root cause of all of the hormonal imbalance symptoms I mentioned above. An independent research group, Women’s Voices for the Earth, discovered that twenty of the most popular products we use to keep our homes and clothes clean contain reproductive toxins such as toluene and phthalates as well as a hormone disrupting synthetic musk, amongst other toxic chemicals. Many of these substances are not even listed on the product labels, because there is no law requiring that the company do this, keeping even the most informed of us in the dark. Anything that has been shown to cause “pregnancy complications” or “cancer” will also cause hormone disruption. Research shows that many of the chemicals found in everyday house-cleaning products are bio-accumulative and very toxic, which means that once in your system, they actually stay in your system and allow for increased free radical damage, which makes you more vulnerable to autoimmune diseases and cancers. As you can imagine, as a consequence of this research, I am very picky about my cleaning products. Especially my laundry detergent, as the residue of this can stay on clothes that then stay next to my skin, and my daughter’s skin, all day long. Despite the labels claiming that detergent will leave your clothes with a “clean, fresh scent” and “2X cleaner,” the truth is that many conventional detergents contain carcinogens, toxic chemicals, and harsh additives. Don’t sacrifice your family’s health for a clean home any more—instead, opt for natural products that really work, like Molly’s Suds Laundry Powder. Unlike other brands, Molly’s Suds is made from just five all­-natural ingredients that really get your clothes clean. Plus, it’s free from artificial fragrances and dyes, preservatives, toxic chemicals, and genetically modified ingredients, making it gentle enough for even the most sensitive skin, like that of my daughter. Not to mention, this laundry powder received an A rating from the Environmental Working Group—that means it’s just as safe for the environment as it is for your family. There’s another huge upside to this laundry soap: Molly’s Suds is super­concentrated, and just one tablespoon will get each load sparkling clean. 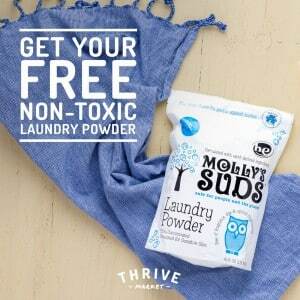 Plus, for a limited time, my favorite place to buy all my groceries – Thrive Market – is offering all new customers a FREE package of Molly’s Suds laundry powder. And existing customers won’t miss out on the fun—they can nab a free package with their next order over $50. I’ve been using Thrive Market for months to stock my pantry and my cleaning closet and I love it, it’s so very easy, affordable and convenient. Just go here to claim your free gift! First, are you chemical sensitive? Second, have you switched to green cleaning products? Wow, I never even considered the fact that cleaning products could have a hand in how my body processes chemicals. Thank you for sharing, I’ll have to check out this detergent!